This tour explores Portland Heights – a mostly residential Southwest Portland neighborhood with Vista Avenue running through its center. 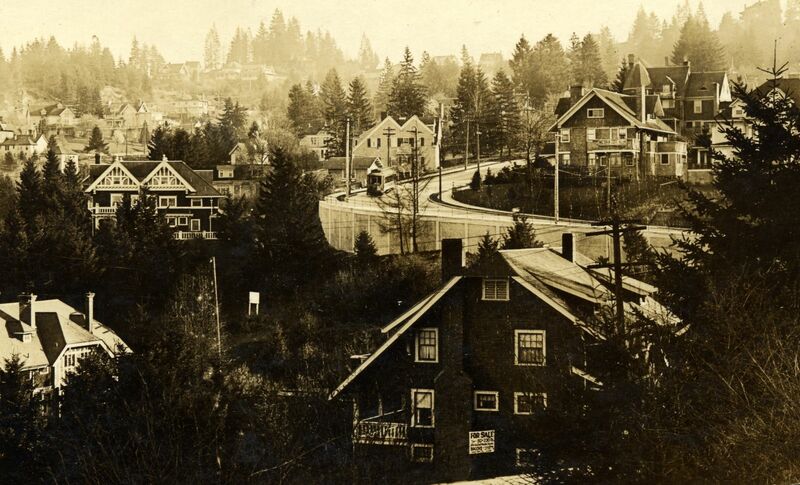 It was once a very difficult area to build in, or even get to, before it became a popular residential district, as transportation options increased in Portland during the late 19th century. Today the mixture of homes, ranging in style from Colonial Revival to Art Deco, is a veritable “who’s who” of Portland architects and their masterworks. On this tour you’ll see homes designed by the likes of A.E. Doyle, Emil Schacht, Edgar Lazarus, and Morris Whitehouse. Be advised that this is fairly strenuous walk. Image: Early 20th Century Photo Postcard View of Vista Avenue, Architectural Heritage Center Photo.